We got a box in the mail from Hogwildtoys a few weeks back. Inside was a skatepark and 16 skaters. 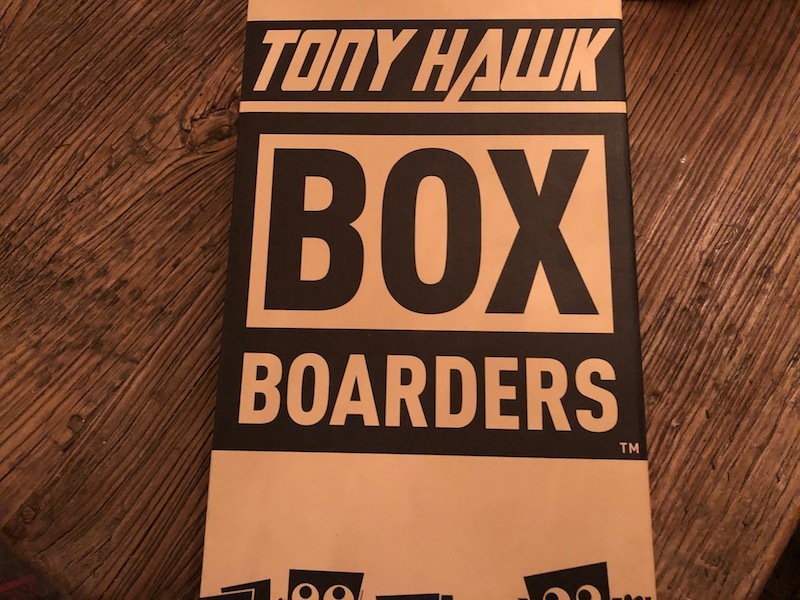 Welcome to Tony Hawk Box Boarders. You might not be aware of what Box Boarders actually are. I wasn’t, and I know the toy industry pretty well. Basically, it is a toy line from Hogwildtoys that centers on pro skaters. They aren’t actual action figures though. Instead, Box Boarders are super stylized, boxy characters. They’re not paper, but plastic, and each one has a ball bearing housed in its body. That bearing, as you might imagine, allows your little figure to actually skate, and that’s the point of the series. That mechanic comes into play in not only shooting your little figs around, but also recording them via the official app. So you can make little skater vids and tape your stunts, just like the pros. Hogwildtoys has a bunch of the skaters out there, spread out across 2 sets. And a seeming good chunk of all of the above is included in the set that we received. 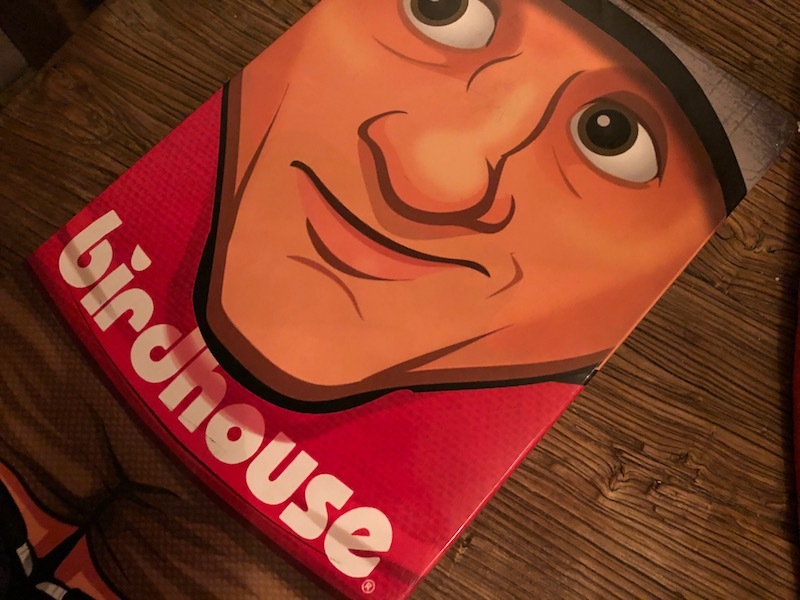 With a slipcover that’s designed to look like a cartoon version of skate legend Tony Hawk, this packaging is pretty striking on the box that we were sent. Once I slid that off, we finally got the clues as to what was on the inside. 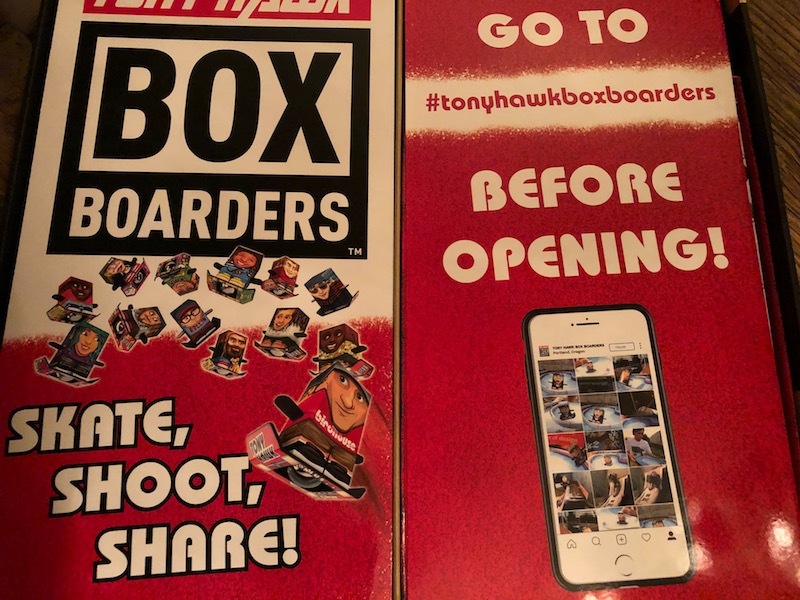 While not technically “in the box”, looking up #TonyHawkBoxBoarders is pretty necessary to this line. It’s a free app that allows users to videotape their boarders. Again, one of the main elements of Box Boarders is pulling off tricks and stunts. Though I guess you could just collect the mini figures too. Pulling off the download directions revealed a pile of boarders, as well as a ‘secret’ compartment with mystery figures and a skate bowl. 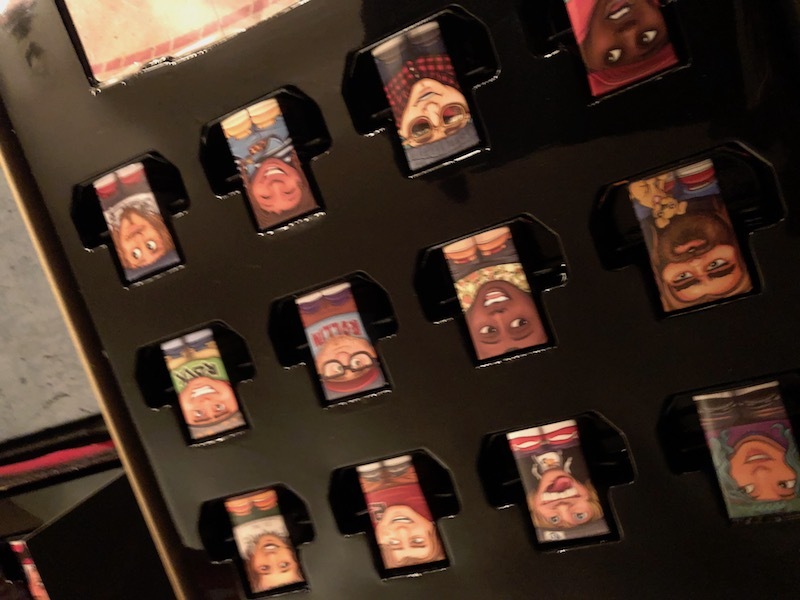 Each figure is made of plastic, and the art work is actually a sticker depicting a cartoony pro skater. These are actual skaters too, not just generic faces. I haven’t really paid attention to the world of skating since the Tony Hawk video games were big, so I’m lost as to who they all are. If you’re a fan though, you’ll no doubt recognize a few or all of them. All of them are also loaded with a ball bearing. I’m sure you can see where that is heading. As for the kidney bowl that was also included, it’s also plastic in construction, and it seems pretty sturdy too. In addition to the above, there are also those hidden mystery skaters. 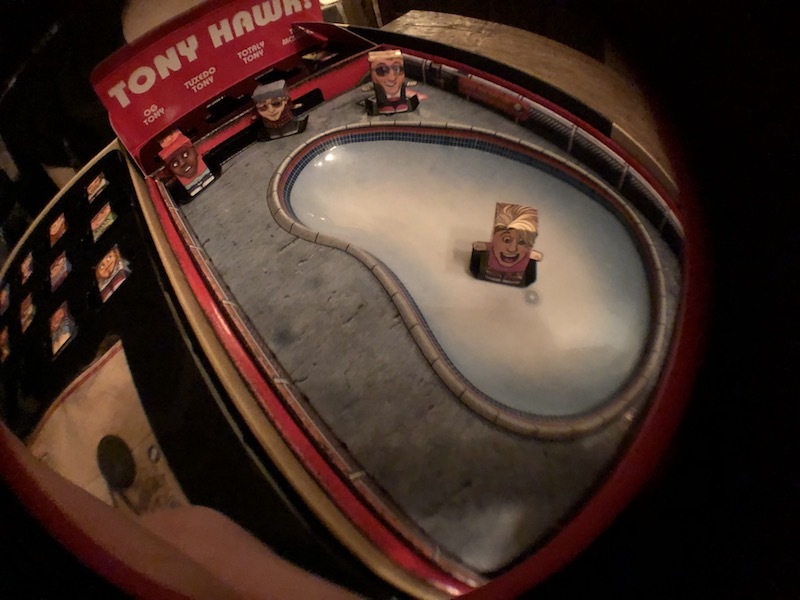 And all of them are Tony Hawk. 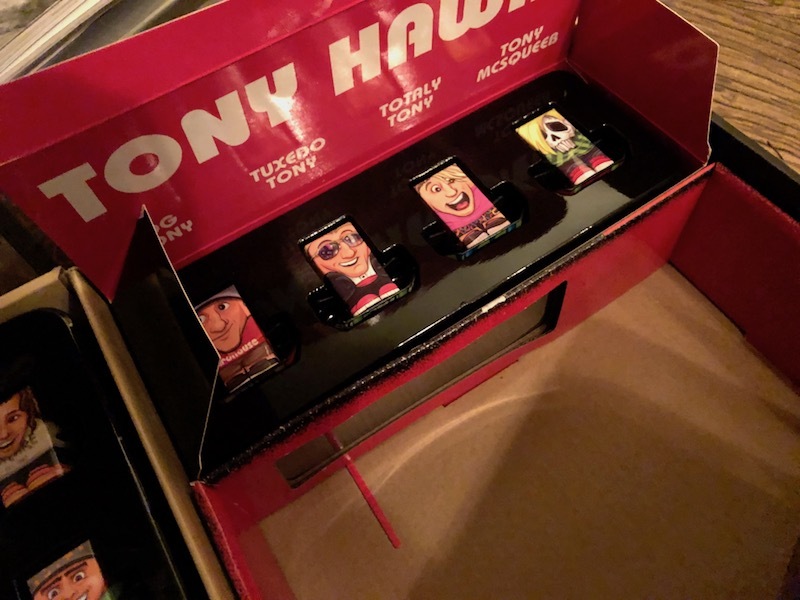 I got 4 versions of Hawk in total in this set, including a classic version, and one that’s a skeleton. 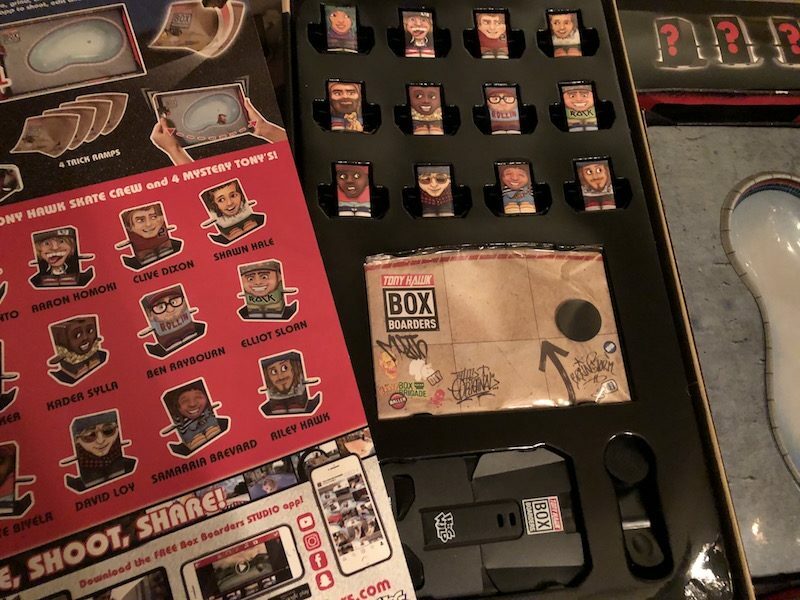 I have no idea why there’s a little undead Tony in this box set, but he’s actually really cool. But this isn’t all playsets and skaters. You also get a really nice fisheye lens for your phone that clips right on, and some accessories for the skaters. Those include a quarter pipe which is great for puling off tricks against walls as well as launching Boarders. Then there’s also a stand for your mobile device of choice. That won’t fit every phone, but it’s pretty versatile and should help you grab some awesome -stable- video of your tricks. To that end, you also get access to the aforementioned Box Boarders app, which is a free download. The app is actually a fairly full featured recording studio, where you can create and edit videos of your Box Boarders in action. You can even add in a voice over or music track, and give your films a great, professional touch. While the box that we got in was something of a sampler with lots to do, there’s plenty out there for prospective fans to choose from. 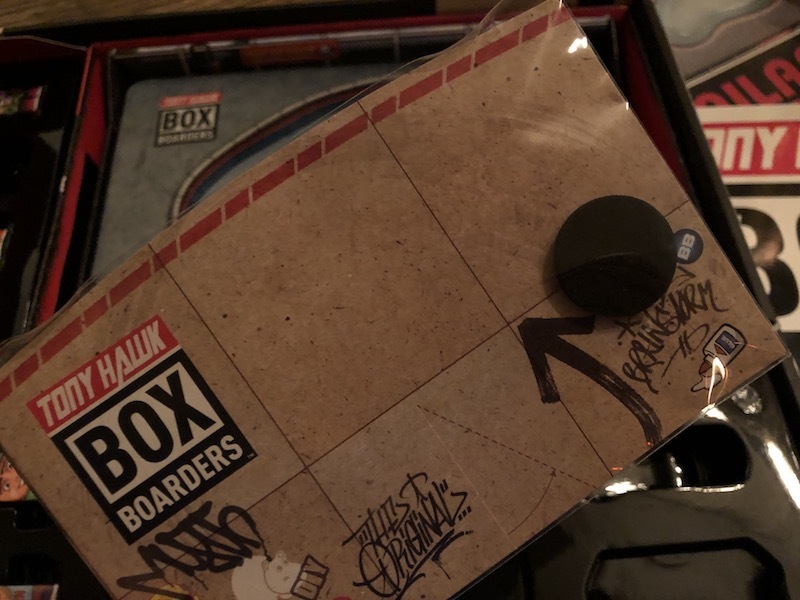 Walmart and Amazon are carrying Tony Hawk Box Boarders, and have a few different sets to choose from. The smaller sets are just $9.99 USD, and get you the quarter pipe, the phone stand, and a pair of skaters (one of which is a mystery). 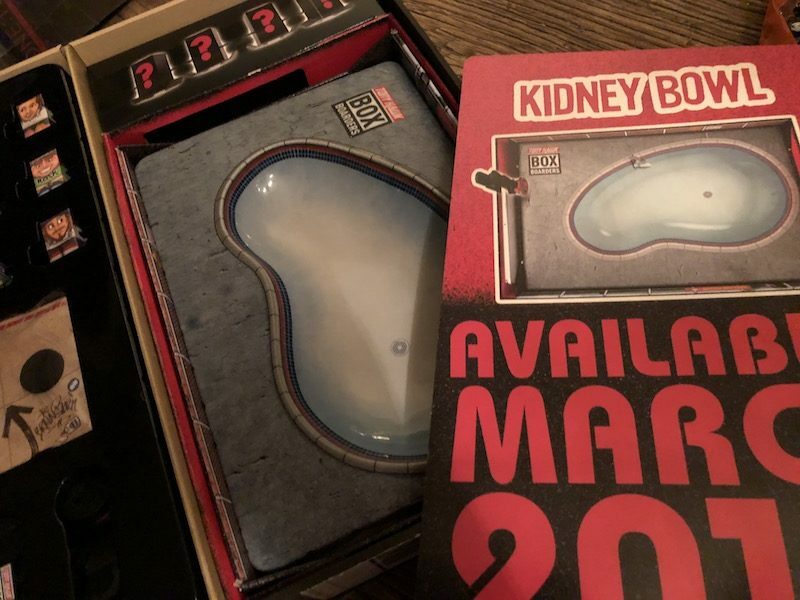 The larger one, called the Super Pack Kidney Bowl Set, goes for $27.99 USD, and includes the above plus the Bowl, 2 more boarders and the fisheye lens. Any will get you going, recording and editing videos, especially since the app is free. So you don’t have to buy a set that includes software or a download code or anything like that. And as you can see from the video above, you can actually pull off quite a bit and make some really fun stuff. Hogwildtoys is really creating a cool little series here with the Box Boarders. 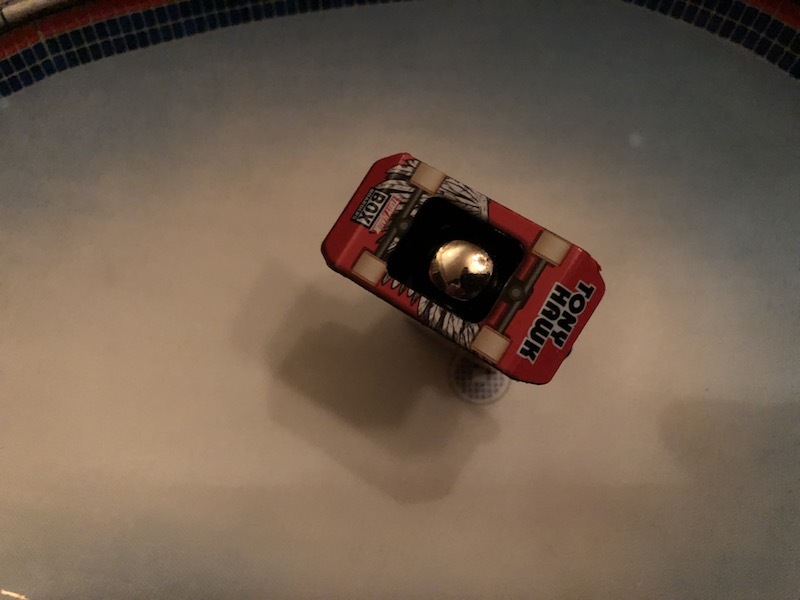 Not only does it have that cool video element that’s still gaining in popularity as goes toys, but it’s also packed with the skater theme, itself making something of a comeback. It’s fun for anyone who’s a fan of the sport honestly, though I imagine kids should go nuts for it. Being both interactive and allowing for such creativity should assure that. 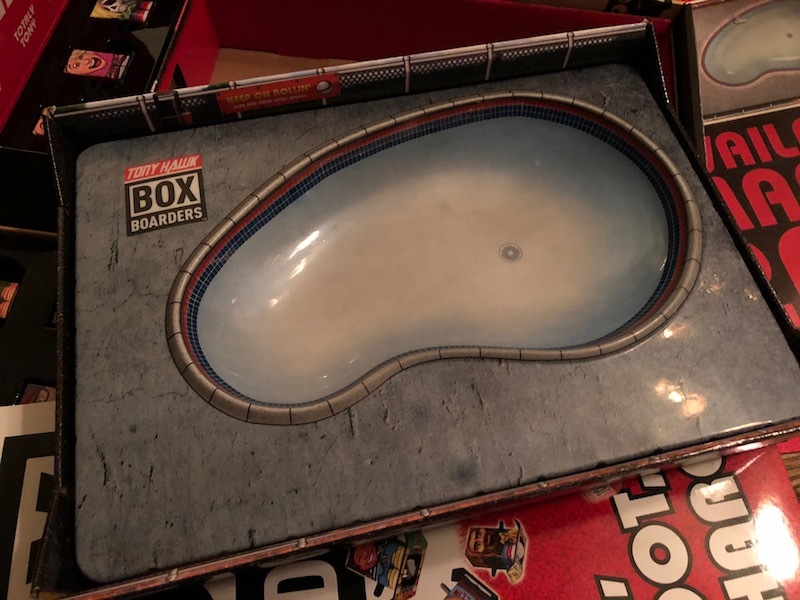 Tony Hawk Box Boarders are recommended for ages 4 and up, and are out there on shelves right now.